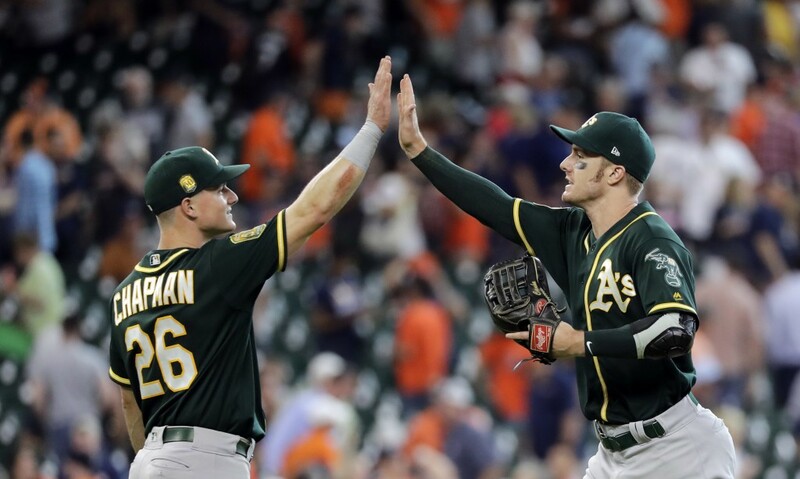 HOUSTON (AP) — Mark Canha hit a two-run single in Oakland's three-run eighth inning, helping the surging Athletics beat the Houston Astros 6-4 on Thursday. Nick Martini had three hits and two RBIs for the Athletics, who improved to 19-5 in their last 24 games. They took three of four from the AL West-leading Astros. Yusmeiro Petit (3-2) allowed one hit in 2 1/3 scoreless innings, and Lou Trivino worked the ninth for his fourth save. Tony Kemp hit a two-run homer for Houston, and Alex Bregman also drove in two runs. Chris Devenski (2-2) got the loss. DENVER (AP) — Gerardo Parra and Raimel Tapia had pinch-hit RBI singles in Colorado's three-run sixth inning. Trevor Story homered for the Rockies, and Kyle Freeland pitched six-hit ball into the sixth inning. Scott Oberg (3-0) got two outs for the win. Arizona left-hander Robbie Ray (3-2) hit Carlos Gonzalez and walked Chris Iannetta with one out before he was replaced by Silvino Bracho, who was called up before the game. Parra then hit a tying single to right, and Tapia followed with another single off Andrew Chafin.